In the meantime, let me tell you that Henry Mitchell has convinced me to try something new, growing Iris reticulata (Japanese Iris) from seed. He made growing Iris from seed sound so simple and rewarding when he described how he did it. And he named the subsection of the chapter on growing iris from seed “Cheap Thrills: Japanese Iris from Seed”. So how could I not try to grow some from seed? I think I will do just that. I picked up the first and so far only seed catalog I’ve received this fall and looked up Iris. They have some ‘Pacific Coast Hybrids’, a.k.a. Orchid Iris, but they are shown as only hardy to Zone 7. Zone 7?! I’m in Zone 5 and I think Henry was in Zone 6. Am I not to experience the cheap thrills of growing Iris from seed? I know Iris reticulata is hardy to at least Zone 5, since I have some growing in my own garden now, pictured above from last spring. So, I quickly found some seeds at a website called Plant Explorers that are for an Iris reticulata that is hardy to Zone 5. Now I need to decide if I should try to sow the seeds yet this fall, if I can get them in time, or wait until spring. Henry said they were best sown in October, but he started his in the spring. If that worked for him, I think I’ll take my chances and wait until spring, too. So what was the question? Does Henry Mitchell’s writing about gardens and gardening stand the test of time? I think so, because even now he’s got me going off in search of a new gardening adventure, growing Iris from seed. That’s a sign to me that the author’s work stands the test of time. He has given me a new idea and instilled in me the confidence to try something I haven’t tried in gardening. I like to read the works of ‘garden essayists’, like Henry Mitchell, even though they may not have gardened in the same hardiness zone as I do or even in the same time period. Reading their books is like a long conversation with a good gardener, who is revealing to you all their secrets, assuring you that there are ups and downs to gardening, and convincing you that it is all worth it. They plant seeds of ideas in my mind on other ways of looking at gardening and new things to try. I hope you are also enjoying reading The Essential Earthman, our 1st selection of the Garden Blogger’s Book Club! When you’ve posted something about the book, send me a comment along the way. Then toward the end of November, I’ll valiantly attempt to publish a post with links to any and all blogs with comments on the book. I’m also still working out book selections for December through March, so if you have some new ideas on books to include, send me a comment. I think I have figured out a book for March, but I'm still am up in the air on the other months. I love essayists, too, and for the same reasons. In LibraryThing I have all my garden essay books tagged "essays," so it should be easy to see if I've got any you haven't read. Carol, this seems to be an instance where the botanical name would help - the Japanese Iris which Henry started from seed were not Iris reticulata [a charming small early-flowering iris that I grew in Illinois] but Iris ensata [sometimes called Iris kaempferi. The ones I've seen were lovely. They're beardless iris, and need a very acid, boggy environment, so I never got them to grow in IL. 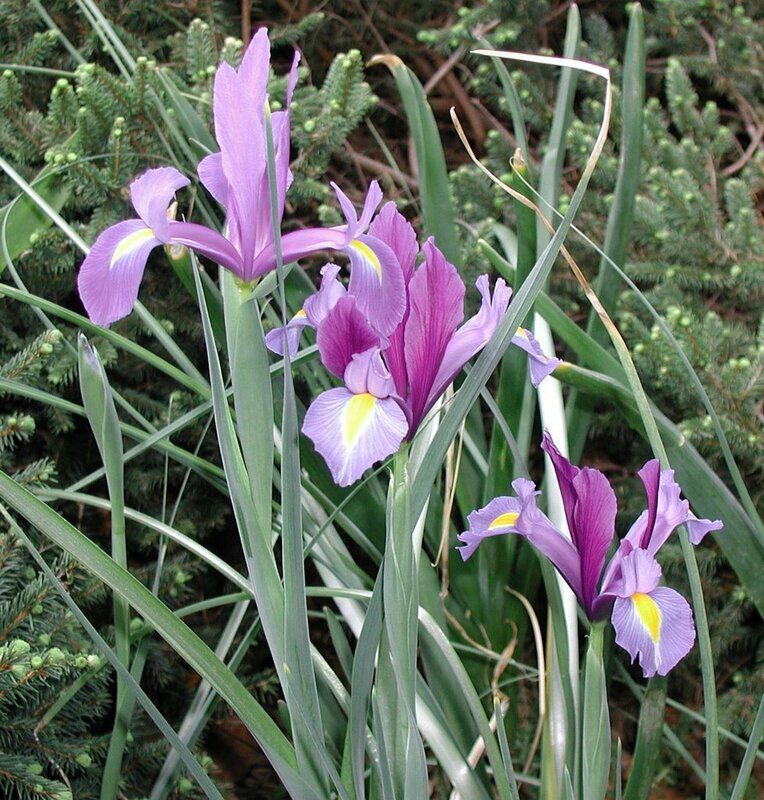 Your Pacific Coast Hybrids appear to be Iris Dougasiana, according to the Pacific Bulb Society. Thompson and Morgan should really have used the botanical name, too, shouldn't they!! The Plant Explorers also have Iris ensata on their website if you're feeling lucky!! Annie... thanks for the additional info. I didn't find a botanical name so assumed "reticulata", because that is what people around here generally refer to when they say "Japanese Iris". I shall do some more research before I buy any seeds. I still want to grow some kind of iris from seed. And if Iris ensata likes boggy, acid soil, than I might be better of off with Iris reticulata, regardless.